Even vegetables have some self respect. They hate it when perfectly normal people question their identity and confuse them for fruits. Ita��s like mixing up baseball with cricket or, for that matter, committing the abacharam of confusing an Iyer for an Iyengar. The tomato was caught in one such terrible mix-up in 1893, when an American gentleman named Edward L Hedden threw the dictionary at it and declared that any a�?seed-bearinga�� plant part should automatically be labelled as a fruit. But the Supreme Court of the United States restored its dignity by asserting that common parlance counts a lot more than botany and if the world referred to the tomato as a vegetable, it shall be regarded so. Tomatoes have never looked back since. 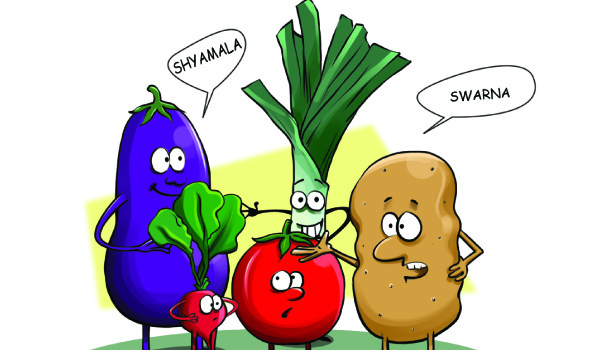 Talking of vegetable identities, do you know that different varieties of farm produce have different names in India? For example, the cauliflower grown in Varanasi is called a�?Kashi Kunwaria�� (aka Varanasi virgin). a�?Deepalia�� and a�?Snowballa�� are the other cultivars. Usually the hue of the veggie decides the name. a�?Detroit Dark Reda�� and a�?Crimson Globea�� are the most common types of beetroot in our part of the world. Similarly, a�?Purple Longa��, a�?Shyamalaa�� (the dark one), a�?Neelakanta�� (blue throat), a�?Jamunia�� (blackish) and a�?Krishnaa�� (dark blue) are brinjal variants. Fenugreek seeds are yellow, so the Indian type is called a�?Sonalia�� (golden). Likewise the saffron shades of carrots are called a�?Kesara��. Green chilli is a�?Haritaa�� (greenish) and red chilli is a�?Lohita�� (copper red). The shape, texture and taste play a role, too. Which is probably why hot chillies have been billed a�?Jwalaa�� (flame); the cool cucumber breed is called a�?Himanginia�� (made of snow); the long necked bottle gourd is a�?Nutana�� (remember the actress? ), the shapely and sweet one is a�?Madhuria�� while the watery type is a�?Gangaa��. a�?Chandramukhia�� is the oblong yellow potato and a�?Swarnaa��, the gold-skinned spud. Sometimes even the season has a say. The okra grown during the monsoon season is touted as a�?Sawania��, the tomato from autumn is a�?Sharada��, the spring cabbage is a�?Basant, the summer potato is a�?Suryaa��, and the all-season chilli is a�?Sadabahaara��. To my knowledge, only one vegetable variety has been named after a politiciana��that too by accident. Ita��s the Indira Kundru (after Indira Gandhi). The moniker was picked as the strain of ivy gourd was developed by the Indira Gandhi Agricultural University. In my considered view, our agriculturists should be having a lot more fun in naming their creations as they are not really dealing with hot potatoes. What do you say?